Kachinas are powerful beings or spirits who, if given due veneration and respect, could use their magical powers for the good and well-being of the people, bringing rainfall, healing, fertility, or protection. There are more than 400 different types of kachinas in the Southwest Indian Pueblo culture, and each Kachina holds different powers and influence. Kokopelli is the most famous of all the Kachina spirits. Kachinas are understood as having human like relationships and may marry and have children. Kachinas can have brothers, uncles, sisters, and grandmothers. Every Pueblo community has a local pantheon of Kachinas that represent the spirits of departed ancestors, spirits of nature, celestial bodies, plants, insects, birds and animals. Kachinas are believed to reside in the pueblo for part of each year. 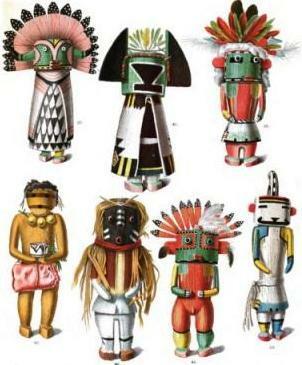 The Kachina spirits are represented by dolls and emulated at ceremonies, that are also called called kachinas. The ceremonies consist of rituals and dances in which the participants wear masks and highly colorful costumes depicting specific kachinas. The purpose of the Kachina dolls are to teach children to identify the various spiritual figures and the symbolism of their regalia and costumes. Festivals, ceremonies and dances of the Pueblo and Hopi tribes feature the Kachina dancers. These celebrations and rituals are carefully prepared in advance of the event. The preparations for the Kachinas are made in a Kiva which is a special sacred building, usually built underground, that is used for spiritual ceremonies, religious rituals and ceremonial preparations by the Pueblos and are strongly associated with the Kachina belief system. The Kiva is symbolic of the fourth world, the home of the Kachina spirits.